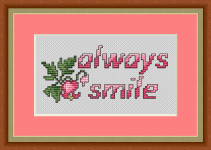 A cross stitch design reminding us to smile! "Share your smile with the world. It's a symbol of friendship and peace." One bright flower for Mother's Day as a sign of affection and love. Happy Mother's Day! Easter theme pattern of a cute yellow chicken - one of the symbols of Easter, blooming violets and the text:Best Wishes. Happy Birthday card with beautiful pansies and decorative frame. Beautiful greeting card for someone special with pansies and the text:Happy Birthday. Cross stitch digits in two sizes: 6 and 7 stitches high. Cute pattern of a purple singing bird. An ideal design for birthday and anniversary cards. 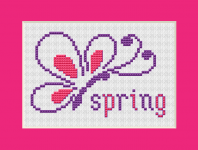 Simple cross stitch pattern of a house with a picket fence. 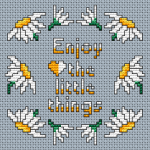 Composition of daisies, arranged in a border and the text: Enjoy the little things. Patriotic ribbon in red, white and blue. Suitable for greeting cards and others crafts projects celebrating Independence Day. 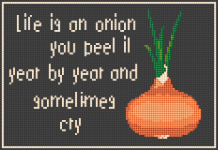 Life is an onion - you peel it year by year and sometimes cry.